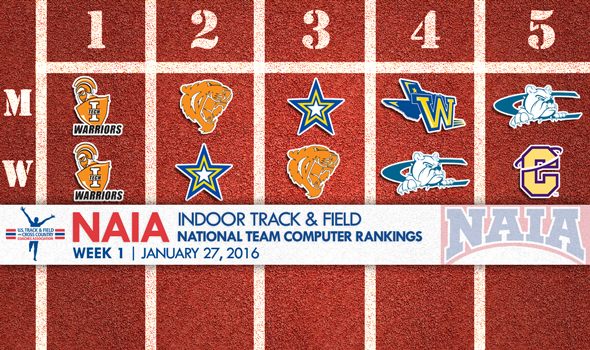 NEW ORLEANS — If the first National Team Computer Rankings for the 2016 NAIA Indoor Track & Field season are any indication, Indiana Tech is in store for a banner year. The rankings, which were released Wednesday by the U.S. Track & Field and Cross Country Coaches Association (USTFCCCA), designated both the Warrior men and women as favorites to win their respective national championships come March. Scores in the National Team Computer Rankings were determined by the USTFCCCA computers using preseason event rankings that include the top marks of the recent NAIA indoor track & field seasons by returning student-athletes and the top marks of the young 2016 campaign. Marks from the outdoor season are not included, nor are marks from incoming freshmen until they compete in a collegiate meet. The point system used in the rankings is not the same as the scoring system used for the NAIA Championships. The Indiana Tech men, winners of the past two national championships, were the runaway favorite with 501.65 points. The Warriors return a plethora of athletes with championship experience in all events. Be on the lookout for Harris Edwards III (60/200), John Broaden (200/400) and Luke Runyan (800/1000/mile), specifically. Following Indiana Tech’s men in the rankings were No. 2 Doane (Neb.) with 333.58 points and No. 3 Siena Heights (Mich.) with 237.53. Rounding out the top-5 were No. 4 Wayland Baptist (Texas) and No. 5 Concordia (Neb.). Other notable ranks include No. 8 Bethel (Ind.) and No. 18 Evergreen State (Wash.). This marks the first time Bethel (Ind.) appeared in the top-10 and top-25 for those programs, respectively. For the women, NAIA needed an heir apparent after three-time defending champion Oklahoma Baptist moved up in classification and why not have it be Indiana Tech? After all, the Warriors finished second each of the past three years. Tia Cooper and Brianna Woods have already turned in strong performances for Indiana Tech this season. Those teams looking to usurp Indiana Tech’s women include No. 2 Siena Heights (Mich.), No. 3 Doane (Neb. ), No. 4 Concordia (Neb.) and No. 5 Carroll (Mont.). This is the highest Siena Heights (Mich.) and Carroll (Mont.) have been ranked in program history. First-year coach Brian Whitlock has the Wayland Baptist (Texas) women sitting at No. 7, while Dave Wood — in his 20th season at Aquinas (Mich.) — sees his women ranked No. 9 to start the season. Will these rankings stay true? We’ll find out as the season progresses and then at the NAIA National Championships, which will be held March 2-4 in Johnson City, Tennessee.